Warning: this review may or may not contain spoilers. 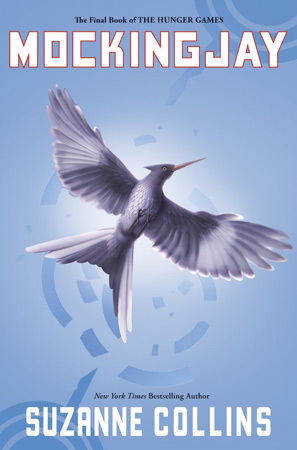 And so we get to the third book of The Hunger Games trilogy, Mockingjay. And if you don’t like when people spoil the surprise, stop reading this right now, because I’m about to say things that may or may not hint you to things in the book. I’ll try not to reveal too much, but there are things I have to talk about. So feel free to only read this after reading the book. Mockingjay is the book where you see people’s true colors. You finally understand why some characters acted a certain way and why things were the way they were. The whole series was told in first person, so there were things we had no idea, simply because the main character, Katniss Everdeen, had no knowledge of them. We were only allowed to know what she knew or have get clues from things through her thoughts. When she questioned things we got glimpses of what could possibly be, but we, as Katniss, could not be sure of them. The book’s messages are stronger. It calls us to realize how much power we have inside ourselves. It tells us not only to question things, but to fight for what is right. And it urges us to find out who the real enemy is. That, to me, was one of the most important messages. How many times in our lives don’t we fight not knowing who the real enemy is? And only when Katniss understands that, she can finally separate what’s real from what’s not. A must read, I’d say.